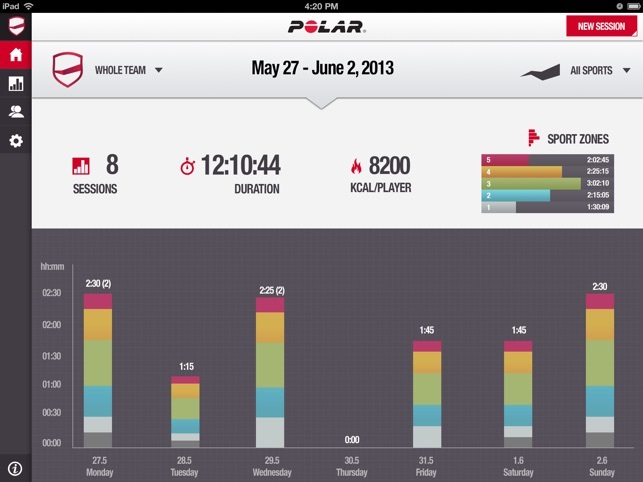 ** Polar Team is ranked among the top 10 Health and Fitness apps in 18 countries! 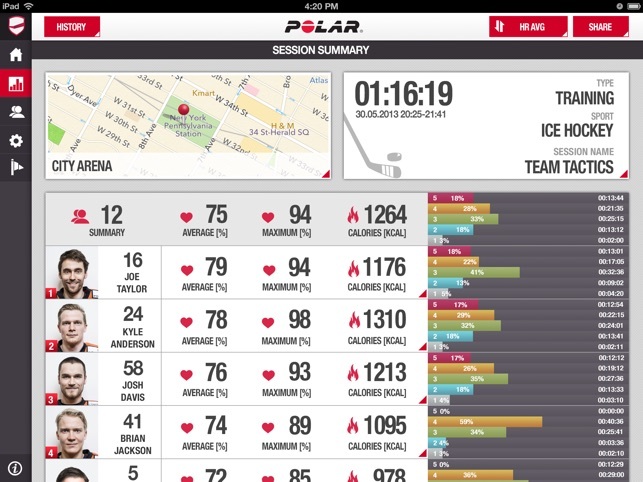 Polar Team allows coaches and trainers of any indoor sports team – basketball, ice hockey, indoor tennis, volleyball and more – to see exactly how hard each team member is working. This allows you to coach each of them individually, in real time. It also provides information to see who is tiring, who needs to work on their fitness, and who may have energy left in the tank. 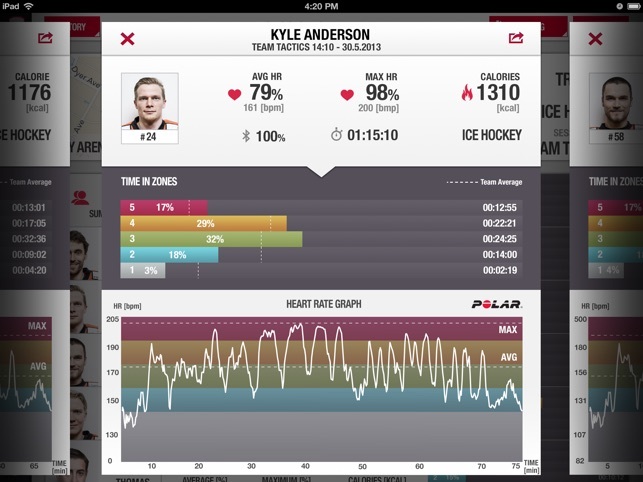 To coach with Polar Team, you’ll need an iPad and a Polar H7 heart rate sensor for each player. Follow the performance of your whole team or concentrate on one player at a time. Spot the differences and guide your players at once. Compare several players on screen in real time. Motivate your players by showing them their effort on the go during training. After the training Polar Team reveals objective data on your players’ performance and shares reports with your players and coaching staff. Use the data to plan your next session. 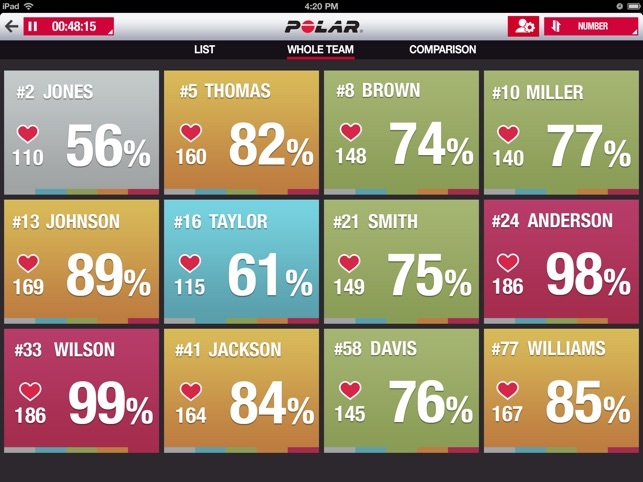 Coach your team to the top with Polar Team. Note: We recommend using the app in indoor team sports only due to limitations in the Bluetooth Smart transmission range. The maximum line-of-sight coverage for Bluetooth Smart transmission is around 60 meters (66 yards). I have over 70 clients who have recently purchased the h7 monitor and have been using it to project their live workouts on my TVs in my personal training center. Now I’m obliged to forcefully enroll in the your polar team pro and pay over $1000 to keep a similar system and on top of that my clients would have to purchase the new monitors and throw away their recently purchased h7...... it seems cheaper to buy iPads and install them in each station .... very disappointed seriously considering changing HRM .. The graphical output and PDF export file may be fine for some fitness applications, but the program lacks a way to export the heart rate data files so a more detailed graph can be made. I workout in my garage with 3-4 other friends. We like to see our live stats on the TV, and got Polar brand specifically for this. Now, we can't air play. Very disappointing. Writing company president. Inexcusable that we have 4 Polar HRMs and they are basically worthless. I want a refund or a solution Polar. Bad business.